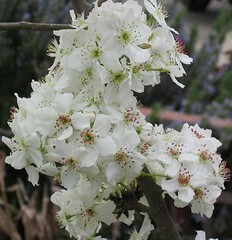 Pulguito’s pear tree is covered with blooms. Last year, we only had a few blooms which resulted in about 6 pears. I’m thinking that I’m going to have to thin the fruit this year. The pears are very good. They are about the size of a large plum. Pulguito loves them; he eats the entire thing, including the core. We get home from work/daycare and hang out in the front yard while DH makes dinner. Because we’re all starving and there is this beautiful, fresh, tree ripened fruit calling to us, we eat it. Then we are too full to eat dinner.